Employers in Ontario will be required to deliver mandatory health and safety awareness training to all employees and supervisors covered by the Occupational Health and Safety Act in 2014, according to the Ministry of Labour. 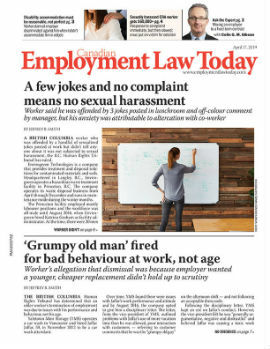 The new rules are the result of Bill 160, which transferred responsibility for the prevention of workplace injuries and illnesses from the Workplace Safety and Insurance Board (WSIB) to the Ministry of Labour when it became law on April 1, 2012. The new training requirement is one of the province’s first prevention initiatives, which will be overseen by George Gritiziotis, Ontario’s chief prevention officer. “Should the proposed regulation be made, employers would be able to demonstrate compliance by having their workers or supervisors complete awareness training program products and materials that are being developed by the (MOL), or by having their workers or supervisors complete existing or alternate programs that met the minimum regulatory requirements,” the ministry says on its website. A transition period will be implemented to give employers time to ensure existing workers and supervisors have completed awareness training programs before the proposed regulation is expected to come into effect, according to the Ministry of Labour. It hopes to make the new rule law by Jan. 1, 2014; however, the date could change as the year progresses, according to Ministry of Labour spokesperson Matt Blajer.